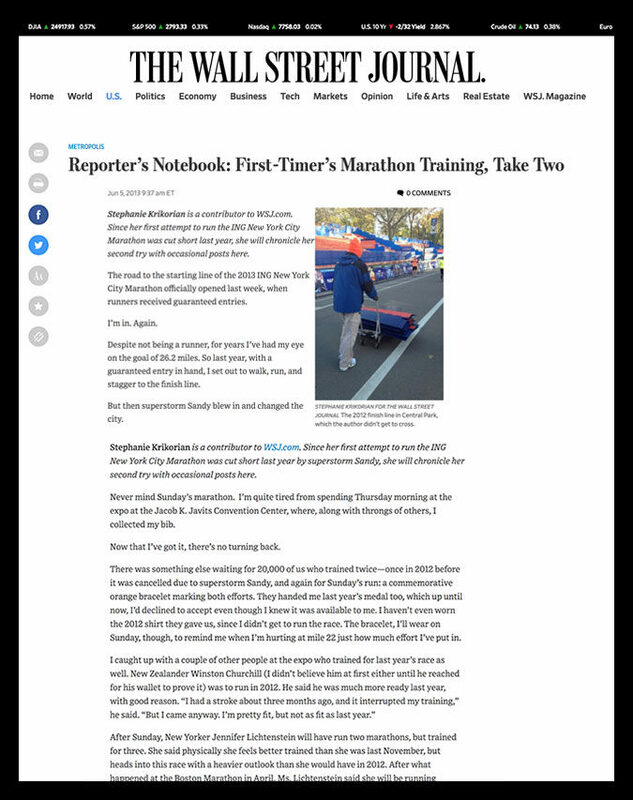 Reporter’s Notebook: First-Timer’s Marathon Training, Take Two – celebrity ghostwriter. journalist. content creator. The road to the starting line of the 2013 ING New York City Marathon officially opened last week, when runners received guaranteed entries. Despite not being a runner, for years I’ve had my eye on the goal of 26.2 miles. So last year, with a guaranteed entry in hand, I set out to walk, run, and stagger to the finish line. But then superstorm Sandy blew in and changed the city. While I wholeheartedly agreed with the decision to cancel the race, training had been like my full-time job. I was in physical therapy three times a week. Even my thumb was hurting come October. But after the storm hit, the emotional torment was far worse than the physical. Morally, I was conflicted. It felt wrong to run. Really wrong given that bodies were showing up on Staten Island and people lost their homes. But the mayor of my city stood up there and said running will be good for this town, so quitting felt like an even worse decision. What critics didn’t realize is that some runners — including some of those living in waterless or dark apartments — didn’t want to let their charities down, so they planned to carry on. But it was a no-win situation. The Friday before the race, my friend called to break the news that the marathon had finally been cancelled. Initially, I was calm. I walked home, broke my clean-eating routine and ordered tacos, and then just stared at the living room wall for hours. It took me a long time to get over not fulfilling that 26.2-mile goal. It might sound cliché, but training for this race was definitely a metaphor for life—my insecurities, self-doubt, and drive magnified and revealed during the quest. It’s a mental challenge without a storm canceling it. With the storm, I felt like I imagined a bride jilted at the altar might–totally left hanging. Some people went on to run other races in the following weeks. Not me. I only wanted to run in New York City. I only had one big run in me. That’s the marathon I wanted to complete and, after that, I’d never run another marathon. So here I am, preparing to run again in November. During training, many people vow never to run again. Like almost every first-timer I’ve spoken to. But the payoff of crossing the finish line erases the anguish, prompting many to train for more marathons. I never had my anguish erased, yet I have to start from scratch again. Knowing what’s ahead is daunting. Things will be different this year. For starters, I need to get about 10 pounds off before race day, which will help on the injury front. While last year I signed up for an online training schedule through The Running Room, this time around, I’ve hired a coach of my own to customize my plan–Sinead Fitzgibbon. I’m planning some long runs ahead of the marathon — the Hamptons Half Marathon and the 18-mile Tune-Up in Central Park — but this year, I’ll take them both a bit slower. And while last year my goal was to finish before sunset, this year, I’m hoping to complete an 11-and-a-half minute mile. Slow, yes. But that’s OK. While I’m bracing for the misery of training, I’m also excited about the enthusiasm New Yorkers have for those running. By October last year, you could feel marathon energy in the air. The streets were flush with people training, and runners felt like they had the city behind them. And, with a lot of hard work, I will be again. NYC Marathon Training 2.0. It’s on. Gulp. Here’s the link to my kick-off story on WSJ.com. I chronicled my training for the ING New York Marathon. It was my second attempt at my first marathon following the 2012 cancellation of the race in the wake of Super Storm Sandy.